Kids in focus groups tasted certain foods as part of a Kansas State University Olathe study on using emojis to measure emotional response. Kids put red stickers on faces that described how they felt about the taste of plain oatmeal. Blue stickers represent the taste of Japanese soda and yellow stickers represent a popular boxed lunch product. OLATHE — Those expressive faces in text messages may do more than tell someone you're ROTFL. Sensory analysis researchers at Kansas State University Olathe believe the icons also may reduce the amount of food thrown away during school lunches by knowing whether kids feel or about the meal. Marianne Swaney-Stueve, research assistant professor of human nutrition and manager of the Sensory and Consumer Research Center at K-State Olathe, and Katy Gallo, Kansas State University doctoral student in human nutrition, Fairfield, Connecticut, are using emoji faces — icons used with smartphones and electronic communication — as a way to measure the emotions kids feel about certain foods. "Kids tend to be very positive," Gallo said. "Even if they say they 'like' a food, that doesn't guarantee they're going to eat it or choose to order it from a menu. We really wanted a way to look at the emotions associated with the foods kids are interacting with beyond whether or not they like something. We also wanted to give them some terminology to help them explain their response to food." The project began when a company that makes school lunches contacted Swaney-Stueve about conducting sensory analysis research that would help reduce food thrown away from school lunches by grade school students. Swaney-Stueve and Gallo believe emojis may offer a standardized way of measuring the emotions kids feel about foods as well as capture a level of satisfaction about a food that a child may be unable or unwilling to fully express. To measure these emotional responses, researchers are surveying kids from local schools about certain foods. During small focus groups with 8- to 12-year-olds, researchers asked kids how their favorite food made them feel. Reponses included "happy" and "guilty." When asked about foods they didn't like, responses included "sad," "angry" and "disappointed." Participants also sampled foods, including plain oatmeal and Japanese soda, and shared their thoughts using an extensive list of words or emoji faces believed to be appropriate for kids and food. A subset of emojis and emotion words were selected based on kids' frequency of use and to avoid redundancy. Research is now being conducted in Olathe to compare the use of these emojis and emotion words on foods such as baby carrots, fresh spinach, cheese cubes, orange juice, chocolate-flavored Teddy Grahams, white bread, white grapes and lychee-flavored gummy candies. This will help refine the emotion questionnaire using emojis and words that were most applicable to this age group. Swaney-Stueve and Gallo are finding that often it's the emojis, though, that are helping the taste testers articulate their feelings. "Some of the things we noticed in these focus groups are that the kids are making a face or saying things like 'bleck' and that they don't necessarily know what word attaches to those reactions," Gallo said. "However, we've seen that many can look at an emoji and feel that a certain face shows what they're trying to convey." Researchers also asked participants about their thoughts on the word- and emoji-based ratings. Older participants tended to use emojis more than words, particularly later in the day. Researchers hypothesized this was because they were tired of using words after school and were very familiar with texting applications. Others favored emojis because they said the faces could express emotions they did not have words for and that the words on the list did not capture how they felt. Kids who were well-read, though, felt the emojis were too ambiguous and preferred to use words for their responses, Swaney-Stueve said. In addition to polling American children, Swaney-Stueve and Gallo are working with the University of Ghana in Africa. They are polling students at 10 different schools in Accra, Ghana, about their emotional response to foods in order to examine whether cultural differences exist. The first test looked at students' responses to the snack packs containing crackers and cheese food product. Most kids expressed disgust based on the snack's appearance but later expressed disappointment that Ghana did not carry the product after taste testing it. The next test, which is scheduled for March, will mirror the taste test conducted in Olathe. Swaney-Stueve has found that students in Ghana are familiar with emojis and frequently used them in their responses. 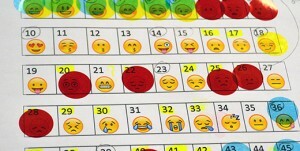 Based on the preliminary tests, emojis may offer a standardized, universal system for sensory analysis researchers, she said. "Language is really nuanced and one word may mean something slightly different when it's translated into another language," said Swaney-Stueve. "Emojis don't change, though. Facial expressions are pretty universal, and with the basic set of facial emojis that we're using they're also cross-cultural."